Going solar doesn’t have to always mean hiring a solar contractor, and if you’re a DIY solar enthusiast who has the time, the skills, and the inclination to so, you can install your rooftop solar array yourself. A fair bit of research will go a long way toward building a successful DIY solar system, and some of the finishing details may be better left for a qualified electrician to do, but much of the labor costs can be absorbed as sweat equity if you’re leaning this way, which may mean a lot more financial latitude when it comes to sizing the system and picking the components. Granted, with the great deals currently available for home solar systems, ranging from $0-down options and tax incentives and solar financing, just to name a few, it’s easy enough to find a professional solar installer these days to take care of virtually all of it for you, but if you want to save cash and you’re handy and willing to learn, then by all means read on. First, you’ll want to calculate your home’s base load, and look closely at your electricity demand as it shifts throughout the day and throughout the year, because matching or exceeding your home’s demand with the output of your solar array is a key element in a successful outcome. Next, you’ll want to spend some time (and money), working to lower your electricity demand through energy efficiency measures, as those “negawatts” are always going to be cheaper than even the most affordable solar system, and will help bring your home’s electricity use more into line with what can be mostly covered by a rooftop array. Some home energy audits can be available for free from local utilities or energy efficiency organizations, who may also be able to point you in the direction of any appropriate rebates or incentives for adopting certain efficiency measures. Third, do a detailed site survey of your home and immediate area, or call for a professional to do a solar site evaluation for you, so that you are well aware of the constraints and/or opportunities for a solar PV system at your specific location. It’s important to understand what the recommended solar panel angle is for your location, and what the angle of the sun is at key points during the year, as well as assess any potential issues with shading from trees or other buildings throughout the year. 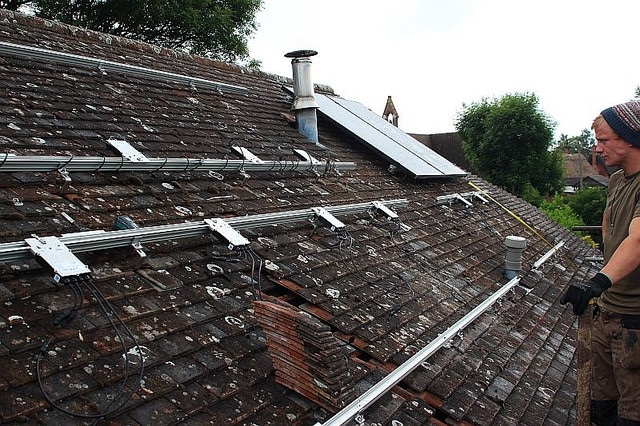 As part of your research and evaluation phase, it may be helpful to take advantage of some of the planning tools available for free online, such as Google Sunroof, which can do some of the ‘heavy lifting’ of evaluating a potential solar PV system. Fourth, find out what kind, and what amount, of incentives are available to you in your location. You’ll most likely get the 30% federal solar credit, but there very well may be state, county, municipal, or utility rebates and incentives for solar installations. Learn what your local utility’s solar interconnection policies are, as well as any requirements to participate in net metering or other solar programs, and make a visit to the city planning or building office and find out the costs and regulations are for getting your solar permit. There are a number of other details involved in self-installing a home solar array, but this overview should give you a good idea of what the project entails. Find out today what a professionally-installed solar array can do for you!